I would recommend using super bulky to create a stiff or sturdy texture. If you use a smaller weight yarn you will have to hold 3 or more strands together. Do not use a larger hook. The stitches need to be tight so the basket will be stiff and stand up. Crochet pretty tightly (but try not to make your hands too sore) My next basket will be made with hemp doubled (the thick kind you can find at Walmart). That stuff is a real hand killer. But it's the sturdiest stuff you can use. Note: You will hold two strands of yarn together. The next round will be the first row of the body of the basket. You will be working into the back of each hdc. Rnd 7: Ch 1, sc under the line or ridge on the back of the first st of previous round. (Half double crochet stitches have a line or ridge on the back of the stitch). You will be working under this line or ridge, not into the regular loops. Continue working sc around. Join with a sl st.
Rnd 8: Ch 2, hdc into next st and in each st around. Join with sl st.
Rnd 9: Ch 1, Working in the back loop only, sc in the same st and in each st around. Join with sl st.
Rnd 10: Ch 2, hdc in next st and in each st around. Join with sl st.
Rnd 11: Ch 1. Sc in same st and in each st around. Join with sl st.
Rnd 12: Ch 2, hdc in next st and in each st around. Join with sl st.
Rnd 13: Ch 1, working in back loops only, sc in same st, and in each st around. Join with sl st.
Rnd 15: Ch 1, sc in same st and in the next 8 sts. Work 8 sc under the ch 7 space. (Do not work into the sts). Sc in next 19 sts. Work 8 sc under the ch 7 space. Sc in next 10 sts. You will increase the bottom by one round. Rnd 17: Ch 2, hdc in the next 9 sts, Ch 9, skip 8 sts, hdc in next 20 sts, Ch 9, skip next 8 sts, hdc in next 9 sts. Join with sl st.
Rnd 18: Sc round, working 10 sc under the ch 9 spaces (not into each st). Join and finish off. Please feel free to leave me a comment or send me an email if you have any questions about the pattern. Edit: I have made a correction to rounds 17 and 18 of the large basket. So sorry about that. I hope it works out better now. Thank you for thefab pattern. I have entered your giveaway, all fingers and toes crossed for my first ever win!!! Just one question,it is asingle strand of yarn,isnt it? Forgive the silly q! Not a silly question. It was silly of me not to clarify this in the pattern. Thanks so much. It is 2 strands held together. I'll correct this now. Im a little confused, If your using 2 strands, do I need 4 skeins of yarn to start? The completed project may end up using only 3 skeins of yarn. It may be easier to work with a 4th skein once you've used the first two, but you can use just 1. Most skeins unroll from the outside and the inside, so you can grab each end of the skein for your 2 strands. Liz, have I told you how much I love you lately? I will be starting this tonight. Thank you so much for posting this!! You are so generous with your patterns. :) Can't wait to make one! I'm so excited I have the perfect yarn at home that was to chunckey for what I had bought it for but perfect for this!!! Beautiful basket! I'm looking forward to making it. THIS IS FANTASTIC!! And just in time for Easter too...I'm making this today:) Thank you for sharing...I love to crochet with thick yarn and larger needles...woohoo! Awsome :) I will be off the next two day from work and will be making a couple of them for the grandbabies for Easter. Might have to try using the three strand method in Easter colors. Liz, I just discovered your blog. Your pieces are AMAZING!! I am mid afghan right now, but can't wait to do this basket. I've already got places picked out for several of them!! Thank you so much for sharing your talent. Thankyou so much for this tutorial, I will definitely be giving these a go, love it!! I think this is the project that will get me started again after a long while (almost a year) of no crocheting or knitting! Thank you! That is such a nice basket! It would be great for holding some of crocheting tools. What a great chunky basket...I'll have to try it. Thanks for the pattern!! You are welcome...I hope you love it! I have one that I love. I am making another in jute. Thanks for posting such a great pattern! I do have a question.... What are the dimensions for the larger one? You're welcome. The larger basket is about 10 inches wide by 10 inches in height. I sold it so fast, and forgot to measure and get photos. I must have been brain dead that day. Sorry about that. Therefore maybe for the larger basket, it should be .... ch7, skip the next 6 sts...???? Actually you caught a mistake. It is supposed to say ch 9. I sold my large basket and now can't look at it to make sure. I still have the smaller one...The person who won it in the giveaway hasn't claimed it yet. I'll go over these instructions again. I may have made other mistakes. You're welcome. You could actually try it the way you suggested and see how that works. It may turn out better than what I planned. Let me know how it comes out either way. Thanks so much for the feedback. Is it 3 skiens for the small basket? How many did you use for the large? At least 4 for the large. Not really sure...sorry. I would buy 4 for sure and maybe 5. Thanks! I had the same question! I'm thinking about making one of these for my baby's nursery bc they're too cute! Btw, I'm a fellow North Carolinian! I absolutely LOVE this basket! I am making some in strips for all my neieces for Easter! The boys are getting solid colors! I am going to try and make a big oblong one to gobetween my chair and couchto hold wips. If you make one using the jelwery stuff (not sure what its called) I would love to see the pics or at least know how it turns out! Thanks for posting wonderful free patterns!! Love this basket! Thanks for the pattern! You can find my version on www.handmadebyeva.blogspot.com. Thanks a bunch for sharing your pattern! It really is a lovely project in style and function. I love all these patterns! Just a question: Are we allowed to sell what we make, not the pattern gut the actual finished project? Another silly question here...it calls for three skeins yet the pattern says to hold two strands together. Wouldn't that need to be four skeins? I was thinking the same thing...and I thought of the two ends...but I can picture myself with a huge knot! LOL We shall see...I am working on this as I speak, I love it! Well I love these baskets you been showing and I see that you have already answered my question about how many skeins I might need to make the larger one. I'll likely go with the 5. And when you say you hold 2 threads together basically they become 1 ... so basically you are crocheting with one very thick thread of yarn ... right? I going on vacation and this is the perfect size project to take along. These will be beautiful gifts ... like in a guest room filled with any necessities your guest may have forgotten. Look forward to hearing from you. So sorry, I didn't get back to you earlier. You have probably already figured it out. I used two strands of super bulky yarn held together. For the basket in the photo I used Lion Brand Quick and Thick (2 strands of it together). Thank you for the great pattern. I'm a newbie and am having trouble with the shape. All the sides pull in except for the side with the seam. Are my stitches too tight? I'd post a photo but I don't want to embarrass myself! You may have to email me a photo, I can't get what you're saying...sorry:) I'll try to help. I arrived to you through Ravelry and I just love the basket. I think I will fill up my house with many of them... Thank you so much for sharing the pattern! Hi! 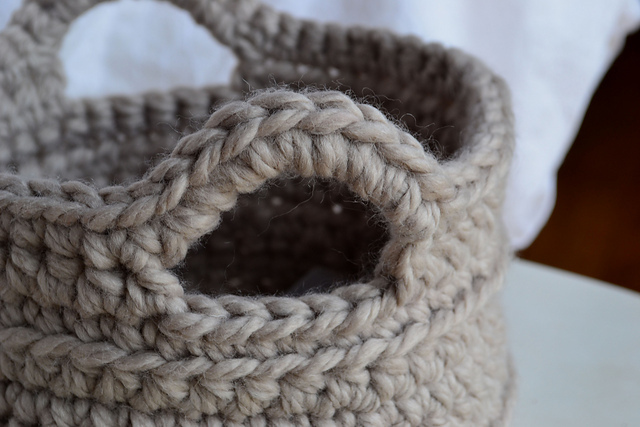 I found your pattern on pinterest, and I think that these baskets will be perfect storage containers for all of my "in progress" knit and crochet projects that I carry around the house! One question, do you think that 2 strands of Lion Brand Homespun would be stiff enough, or would it be better with 3? I have a few skeins of a color that I have been waiting to find a project to use on, and I think this would be perfect! For me 2 strands of the super bulky are thick enough. 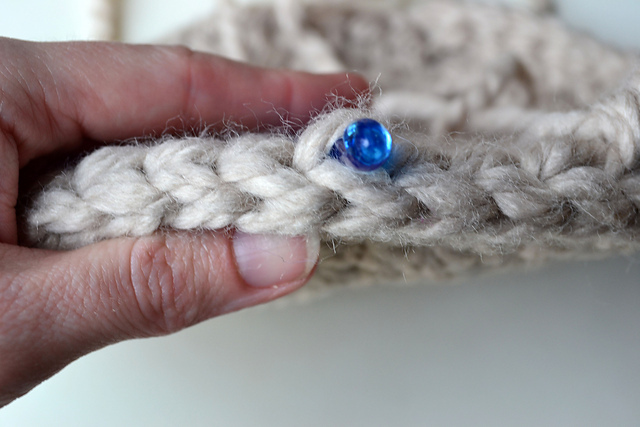 The trick is using a smaller hook and crocheting tightly as you can. But if you are using Homespun then I would definitely use at least 3. I started crocheting a week ago... and am half way through my first project. I can't wait to start this basket. Beautiful, requires very little easy to find yarn and no difficult stitches or patterns of stithes! Thank you so much for sharing. My plan is to make the larger size and then an even LARGER basket. How would I increase the diameter of the bottom? Thanks so much for sharing your talent with us! I just made my first basket, and I am in love. This one is a gift, but I need to make half a dozen just for me/my house. And I'm thinking I will make the next one with some t-shirt yarn I have made. It's so thick and sturdy - just the thing! Thanks again for posting you patterns for free. You made my day! 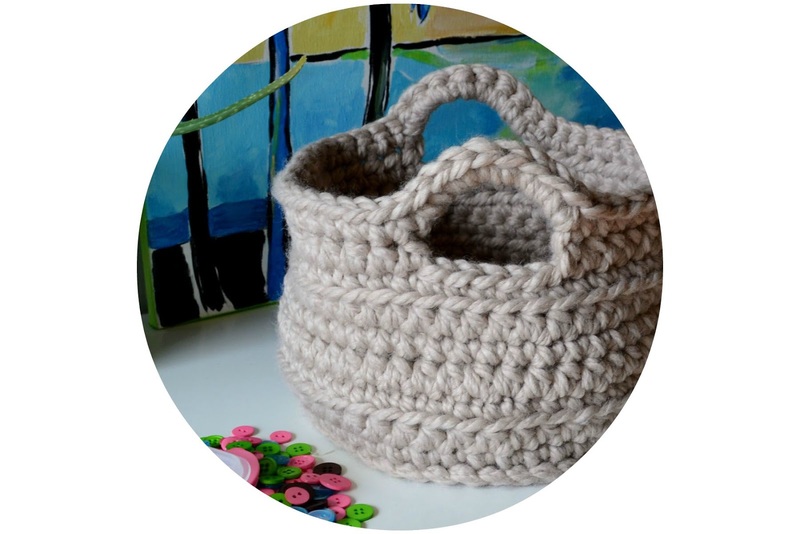 I got to your blog through pinterest -- and love the chunky crocheted basket. I'm definitely going to make one (and maybe many more) for the "hot spots" in my house to contain the clutter, etc. Thank you so much for posting the instructions. While on your site I also saw the gorgeous purple crocheted dish cloth. How very elegant looking it is. I've been knitting these cloths but would love to try the crocheted pattern too. Please send it to me at your earliest opportunity. And again, thank you so much for sharing!! The pattern for the dishcloth is here on the blog for free. Just go over to the right side and look under the free pattern section. I usually buy the super bulky yarn like Lion Brand Thick and Quick or Quick and Thick. It is a wool/acrylic blend. If I can't make it to AC Moore of Michaels, then I buy the Hometown USA, also by Lion Brand, at Wal-mart. It's acrylic. I don't have any trouble with moths. I LOVE it! I'm soooo trying this! Thanks for sharing your patterns! I have a feeling I'll be snooping around your site for a while! 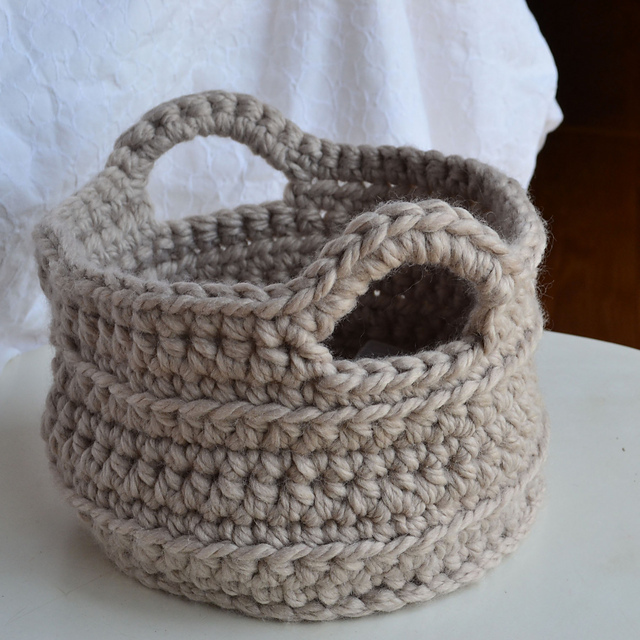 I love this crochet basket! I have it on my list of things to make for my soon-to-be home! Hi! I love your work and I want to post the pattern in spanish language at my website www.kechulo.com. Do you agree? Well, I'm going to post it but if you don't agree I will take it out. You can see it at www.kechulo.com. stupid question! I know you just "open" two skeins of yarn to double strand it, but how do you double strand the third ball? 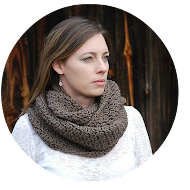 How do I know if I am crocheting it too tight or too loose? Sorry about not responding sooner. It is hard to tell if you have just started crocheting. If you crochet too tightly your hand will likely hurt. Too loose and your stitches are flimsy or just plain looser. I know this isn't a grand explanation but following the gauge is a good indication. Thanks for the pattern Liz! I really like the way it turned out. I'll definitely be back to your site for more! I really like this basket. I did make the stitches tight, made a slight change, instead of putting sc's on handle, handles were to wobly, I undid the sc & made some HDC's instead & then either left it all same color, but last night I made a brown one & added turquoise sc over the hdc on handles & worked out great! I gave it to a lady that like brown/turqouise. I am making the smaller ones for they look great. The big one I made is red, but if I undo it, the yarn would not be good to reuse, so will give to someone that I know will appreciate it. Next I am about to go to Walmart to shop, will get some more yarn & make more. Liz, this is a pretty thing you made & thanks, they are so darling. Liz...I took a chance for pic is zoomed, which is great, but I took a chance, I'm used to videos. Where you have picture of hook under the ridge you mentioned, I took a while to examine my piece, is it on the side where the tail of the very beginning is at or the other side? Sorry I don't understand what you are asking. I took that picture to show where to insert hook. It is on the wrong side or back side of your piece. When looking at the photo the back side of the piece is facing up. 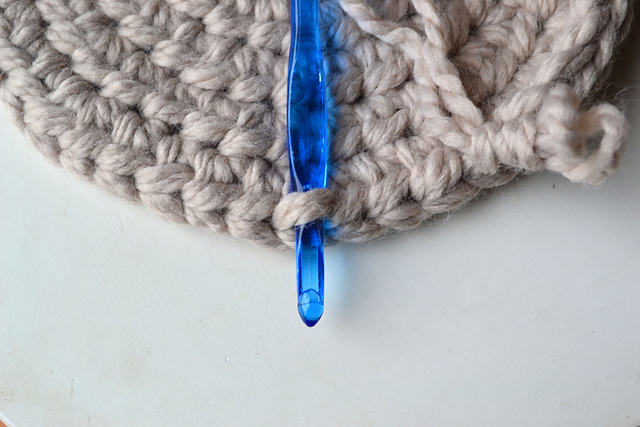 You'll hold the piece with the right side facing you as you crochet that round and sort of angle it to look at the back to see where to insert the hook for round 7. Love this pattern. Thank you for sharing it. I followed your instructions (with a few tweaks) and am super happy with my new basket. Will definitely be making more of these! Hi Liz! I love your blog and all the beautiful things you've created! I'm working on the basket, and I'm having a problem with the sides "curling" in. I'm on the 4th round of the body, and it's curling in towards the center of the basket. I'm using the yarn and hook size you suggested, and I tried loosening the stitches. Will this just work itself out as it increases in height? I would love for this to work, and to make more as gifts. Any suggestions you can give are appreciated! Thanks so much! Thanks so much and I'm so glad you found something here you like. The only reason I can think of is adding or losing stitches. Make sure to count your stitches to see if you are keeping the same number for each round. This can really change the shape. I love this basket! I'm really stumped on the handles. Can you explain how to crochet under the handles please. I really want to finish but I have no ides what to do. Thanks! Any chance you can post a picture about the handles? Thank you for the amazing basket patterns. I started the large one but quickly realized I would run out of yarn (trying to use up my stash.) So I just finished the small one, it was a very quick project and so cute! I made mine with 3 strands of cotton yarn (Like Peaches and Cream). It stands up well and holds it's shape. Next time I'll try the big one with acrylic yarn. Thank you again! Thank you for this tutorial! Your instructions are very straightforward and easy to follow. I really like the way the basket turned out and appreciate you sharing the pattern. Thanks for the great pattern! I'm working on my basket now and have made the bottom with no problem, however I'm having trouble now that I'm onto the sides. On round 8 I can see a bit of a seam/gap where I joined the rounds. I'm new to projects that involve joining rounds so I'm not entirely sure I'm doing it correctly. When you say to hdc into the next stitch, you essentially mean to skip the first one, right? Are you counting the initial ch 2 in the total hdc count in rounds 3-6? If I were only counting the actual hdcs (not the ch 2 or the sl st) from round 8 on, how many stitches should I have? I can't work out if it should be 46, 47, or 48 :( Sorry about all the questions! I hope they make sense. I'm very confused by this, if you couldn't tell! Hopefully you are able to respond soon or I figure it out for myself, because I can't wait to have this basket completed so I can use it to store some of my extra yarn :) Thanks again! Not sure if I did something wrong. But I added a few rounds to the base to make it a wider basket, because when I finished round 6 it seemed rather small, then I made it a bit deeper too. The problem is I only used 1 1/2 balls of the recommend Lions Brand Wool Ease Thick and Quick. But then again...your stitches appear chunkier than mine too....Any suggestions? Or maybe you can explain your note a bit more: "Note: You will hold two strands of yarn together." Maybe I didn't hold enough strands together. Do you have a picture of this? For the longest time, I wanted to buy a basket like this on for my baby's room for her little socks and another for her little toys. I am so excited to see this pattern and this will be my next project for some time. I am making one large enough for my laundry room as well, thank you for this mazing pattern. Apart from needing six small baskets. Awesome pattern , thank you once again for being kind to let us all use this and many more yummy patterns. I did this in lavender and used three strands of worsted weight. All it took was one skein of 7oz. I divided it up into three balls and even had some left over. I wanted to post a pic but do not know how. Thanks for the pattern. Love your patterns! For the "chunky" yarn projects, do you think tshirt yarn would work? I realize it might not work up as "stiff" in a basket shape as yarn. Thank you - I love this basket. I made it in two sittings, love how fast it goes. Filled it up with a few balls of yarn of course :) I can't wait to make another. One question - I want to try the next one without the seam, so in the round. Not sure how to do this. Can you please explain? You pattern is clear and simple but I can't figure how to do it 'in the round', i.e. not sure what that means. what do I do when it says slip stitch at the end and do I start out differently in the new row? Thank you for this wonderful pattern. I'm making it with three strands of DK in a 'tweed' effect yarn (beige/mushroom in colour with tiny flecks of green and tan here and there), using a 6mm hook and it looks great! I'm editing to add I decided the basket wasn't quite rigid enough so I've now used a 5mm hook (with three strands DK) to make three more in different sizes. Love them! Making this as my first ever crochet project. Really pleased with how it's going, it's looking fab before I've even finished it. I'm finding your instructions & pictures make it wonderfully clear what to do, thank you. Wow, your first project. I'm happy you chose this and I really hope you love the finished product. Thanks so much for the feedback. Is there a way to print the pattern without all the comments? I know I already answered through email, but I thought I would answer here in case anyone else was wondering. Have you tried ZPAGHETTI? It's made of t-shirt strips sewn together into a giant spool. You crochet with a #15 hook (I don't know the US equivalent) It's pretty stiff & very suitable for this stuff. Thanks for the pattern! Awsome :) this was my first zpagetti project. I really need to try the zpaghetti. I love the color you used. Thanks for sharing this pattern, it was just what I was looking for. I hope to start it tonight. You can see the results on my blog http://mylittlecornertoday.blogspot.nl/ where I will of course give you credit for being so lovely as to provide this free pattern. Thank you so much for posting this pattern! What a beautiful basket! I just started mine but am confused about starting the sides of the basket. You said work into the back loops, but your picture looks like the front loops. Do you turn the bottom of the basket over before starting the sides? Yes you work in the back loops. It's all about the way you hold your work. I've noticed some people end up crocheting and actually have their baskets inside out. That might be why it seems like the front loop. Yes, it should work. I would love to try it too. I just found this pattern and whipped out a basket. Literally...WHIPPED out a basket. I LOVE it!!! I am a knitter, not a crocheter, but your instructions were incredibly clear and the pictures you added answered the few questions I had. The only thing a crocheter friend noticed is that you didn't indicate chain 2 in Round 2. She suggested that I do the chain 2 since it's indicated at the beginning of all other hdc rounds. The basket looks great! If possible please to ask a question about a pattern of the basket Body. "Rnd 8: Ch 2, hdc into next st and in each st around. Join with sl st."
Because there is a punctuation mark between the number 2 and the HDC is not clear whether I need to create two chains and then 1 HDC in each st around or 2 HDC in each st around? When you begin the round you need to ch 2, which is really the first hdc of the round. Then you'll put one hdc in each stitch around. Hope this helps. I am getting organized as well. Can't wait to try this with tee shirt yarn. This is absolutely gorgeous, thank you for sharing the pattern. As a newbie crocheter I'm a bit nervous about working with such a think yarn, and double stranded at that, but its definitely going in my to-do pile. I am officially following on Pinterest and reading along through my WordPress. I am new to the North Carolina, Asheville area, but I am totally in love! I too am a plant lover, mine are in love with NC also. I have been a crocheter since about age 8, I'm 51, soon to be 52 :-D I taught myself how to knit in 2006 while attending a Father going through the process of passing from one life into the next. I can read instructions and do well, but when you add a simple thing like video, you'll be very happy how clear it makes it. YouTube is THE place for all knitting videos. I am a mad knitter now. I'm also on ravelry. I'll keep an eye open for you. Congrats on deciding to get married, I won't mention how many times I have been ;-) They make us crazy, but I personally need them, lol. I do not understand why you make us hold two strands together, why not simply buy chunkyer yarn? Or am I missing something here? I love the basket model btw! I used super bulky yarn (6) so it is the chunkiest available (in most stores anyway) then you double it. It needs to be super bulky doubled so it will stand up and not flop over. So I crochet with TWO strands? Where does the THIRD ball come into this? Thank you for the awesome pattern. It's been a while since you posted your question but since I was here I thought I'd answer it. If you were crocheting the "regular" way with 1 strand of yarn, you'd use one and a half skeins to complete this basket. Because you are crocheting with 2 strands, you're doubling your yarn usage so you will need 3 skeins. Does that make sense? Thank you so much for posting this tutorial. I made mine a shabby chic basket by using a vintage queen size sheet cut up into one inch strips. It looks fabulous!! Thank you SO much for sharing this pattern. I was looking for it for ages!! Love, love, love this pattern! I did have a question--For some reason the right side of the crochet ended up on the inside of the basket on my first attempt. Did I miss a turn somewhere? I made a smaller version and fudged a few turns I ended up with the right side on the right side. Could you please help me? I think the problem began with the bottom. Should the right or wrong side end up on the bottom? Thanks for any help you can give me. Hi! Love the pattern! Just finished a large and small basket. What keeps tripping me up is the following: when I join at the end of a round (specifically the sides), am I joining into the starting chain, or the 1st stitch? I ask because I'm ending up with about 3 extra stitches. I appreciate any help you can give me. hey I love this! I was wondering if I could sell the finished product made from this pattern? Love this!! Thanks for sharing your pattern :) made one with tshirt yarn and its adorable!! may i ask what hook size you used please? Amazing pattern and lovely outcome! I saw it a few months back and decided then that I wanted to learn how to crochet. Thank you for inspiring me to do so <3 I made it using plarn (plastic bag yarn) and I love it. Thank you for such an easy pattern to follow. I am in England, so I will have to convert your pattern but I have my chunky wool and I cant wait to get started! I shall do it this afternoon! Can you recommend a non-wool yarn for this project? I am allergic to wool, but I really wan tot try this. Thanks! Hi chem, I made this last night with Hoooked Zpagetti and it looks brilliant. Zpagetti is made from old t-shirts and the label says it is 92% cotton and 8% other recycled fibres - maybe okay for you? Hope this helps! I think Lion Brand's Hometown USA is 100% acrylic. I have used it for these baskets and it works great. Just made this. Great pattern easy to follow. Have you ever felted any of the baskets you've made? If yes, any pitfalls to look out for? Thanks. Thanks for a clear pattern and a great shape - mine took an evening to make and it's just so much fun to look at! You're welcome and I'm so glad you like it. Thanks for sharing the pattern, I'm using it for inspiration in my next laundry basket project which I've just blogged about... happy crocheting! When working this pattern, the right side of the bottom of the basket will be inside the basket. Unless I turn my work to start building the height of the basket, the right side will still be on the inside. Is this correct? I would prefer the right side of the body of basket be on the outside & the wrong side to be on the inside, so after I finish the base, I'll turn my work. The right side of the bottom will be on the outside. You never have to turn. I have noticed that a lot of people Are crocheting the basket with the inside out. Just remember that your work that is facing you as you work will always be the right side. Do not turn. Thank you for this wonderful little pattern, it was super easy for someone like me with very basic skills. My basket is very cute and it worked out perfectly! Hi quick question, if you work with 2 skeins surely we will need 4 balls? Looking forward to starting making for my friends baby bits and pieces. Love, love, love this! Crocheted it this afternoon in two colors. I was going to give as a gift, but may rethink that! Thanks for the pattern! Thank you so much for this pattern. I can't wait to try it. This is the funnest thing ever! Thanks so much! I made the large one out of yarn I made from recycled tshirts. The result was just wonderful. I am selling the yarn I make to a local yarn shop and they wanted a sample of tshirt yarn made into something. So, I made one of your fabulous baskets. They also want to have the pattern available to give to anyone who wants a copy. I just wanted to double check with you to see if I can print your pattern out and give you all the credit that is due. It was generous of you to give this pattern away online, I just wanted to make sure it was okay to give away hard copies of it at the local store. Thanks again! That's wonderful. Thanks for asking. I'm glad you like the basket and I hope everyone else does too. hey there! thanx for the great pattern, it was super easy to do and I have the cutest little basket that actually stands up on its own! Thank you for sharing this pattern! I used plarn (plastic yarn) and turned the mess of grocery bags under my sink into a quite lovely little storage space! Fantastic basket! I finally made one yesterday afternoon and love it. One question though - when you are crocheting around, are you on the inside or outside of the basket? Thank you so much for the pattern. I will definitely make more. I'm on my 2nd basket now and figured out where I got confused on my first one. It was on the row after making the bottom edge. I was still working from the inside. It doesn't look bad, just not accurate. : / Anyway, my 2nd one is coming along great and even easier after making it once. Thanks again! 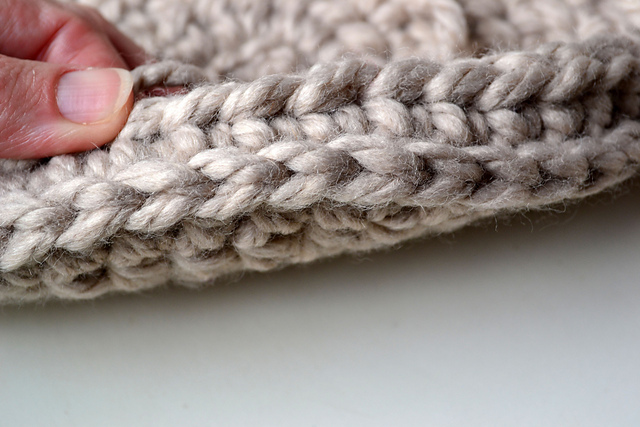 As you crochet, you will always be looking at the right side of the stitch. It will be the outside of the basket. I notice a lot of people get their baskets turned inside out as they go along. I think this may be what I did incorrectly. I was working from the inside as I built up, and it come out a bit flimsy. I also only used 3 skeins on the large basket with it doubled up (Lion Brand thick and quick). So, do you turn after you do the first row in the body of the basket to get it to the outside? Hopefully I can correct this for my next one!! Thanks! Thank you so much for the amazing pattern. I loved it!! Beautiful pattern, thank you so much for sharing! What an amazing pattern, Thankyou! I must be missing something, but I'm a bit confused when following the pattern as to wether you count the ch2 and ch1 as a stitch in each round? Do each rounds have 48 stitches PLUS the ch, or is the ch counted as the first stitch? The ch 1 does not count as a stitch. The ch 2 does count as a Hdc. Hope this helps. I just finished making the small basket. It worked up very quickly and your instructions were great. Thank you for sharing your pattern! I love this pattern! So easy to follow and easy to work up! I made mine out of one skein of Fettuccine tarn using two strands at once with a 6.5mm hook. Its the perfect size for my lace materials! Thanks so much for the pattern! It was exactly what I was looking for!! Thanks so much . I made this with t shirt yarn I made from shirts I found at the thrift store. It is a beautiful basket. I'm having problems with keeping 2 strands of the wool ease thick and quick on the hook. While pulling through the loop, one of the strands fall off. Do I need to use 2 strands of the wool ease thick and quick. I went to 1 strand but I am not sure if that is working. Please give some tips on this. I read other posting and now know about my question on only 3 skeins. I still need advice on how to keep 2 strands on the hook of the crochet hook. Can this basket be done using t-shirt yarn? If so how wide would I cut the strips? I'm thinking maybe 1 inch wide, but wondering if I would still need to work 2 strands as though they were one? I saw a video of a step-by-step instructions for a basket almost like this one - it had the handles and was made with a solid color on the bottom and as it was crocheted up, they changed colors every 5 rows but it was done with a shell stitch as they were going up and then changed back to single stitch as they got closer to the top of the bag and with top/handles were the same color as the bottom - it was a beautiful basket, I think it was on you tube and if I'm not mistaken, it was you that was showing it being crocheted. Where can I find this pattern on video as well as written pattern. I just finished this basket and love it! I used Bernat Softee Chunky acrylic and it worked well. I would love to block the basket to finesse the shape a little. Have you blocked these baskets? How do you do it? Thanks! This is a lovely basket. This is beautiful! Have you ever made a rectangular basket? I need baskets to organise wardrobes and linen cupboards and I'm wondering if it's possible to crochet them? I thought you might know. Thank you. I love this pattern and have many many. Inserted a clear round light weight plastic container that I found at Walmarts outdoor lawn dept. makes the basket much sturdier. Fits perfectly😊 Thanks so much for the great pattern! Thanks for the pattern! I just made one using five strands of scrap yarn that I needed to get through and it turned out great! If you're interested in seeing, check it out here: http://lisascrochet.blogspot.com/2016/01/scrap-basket.html. Thanks for this, just made one with some thick-thin super chunky wool. Really pleased with it and a clear and easy to follow pattern. Many thanks.